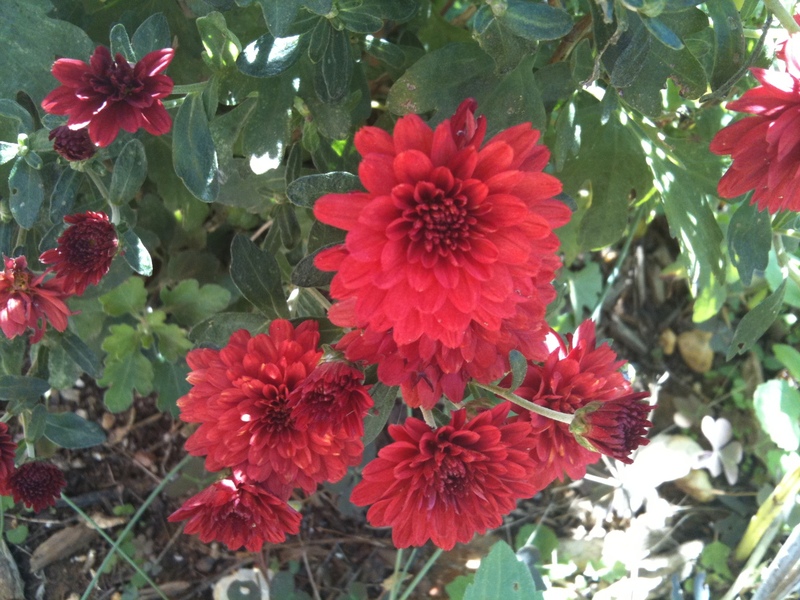 Gardening in Northern Virginia | Working with the clay, not against it. taking pruners to the various weed trees planted by the birds. Next up: trying to find a place to have dinner that won’t be sportsball crazy. If you are a gardener in North America, you can be proud to be a member of a community that has been going strong since the beginning of human civilization. If you are gardening in the United States, you can claim to be part of a gardening community that has been actively growing and cultivating plants since the mid-1700s. The D. Landreth Seed Company has been selling seeds to growers and gardeners since 1784, and claims the title of “Oldest Seed House in America.” Landreth brought some of our most beloved seed varieties to gardeners in the United States for the first time. If ever there was a company that could claim to be an American original, it’s Landreth Seed. Landreth Seed may not be around much longer without your help. The company is in danger of closing because of a clerical error, and their lender isn’t willing to give them an extension on their loans. Landreth Seed Company needs to raise approximately $250,000 (short-term) to stay in business. To help save an American icon, please consider purchasing a catalog, designed, published, and printed right here in the United States. You can purchase non-GMO seeds, gifts, and my personal favorite, the notecards. We had to move all the potted plants inside last Saturday afternoon. This included all of the SeedGROW plants and my baby shrubs. Woo. That sucked. And we didn’t even get enough storm to make it worth the effort. Better safe than sorry, I suppose. I’m growing with the SeedGROW project. Thanks to Reene’s Garden for the seeds. I’m a little bit behind the SeedGROW pack with my plants because I was out of town most of the month of June. 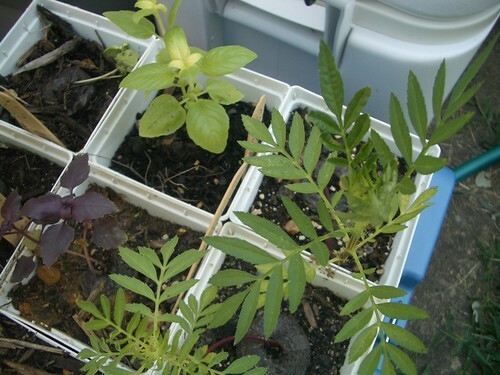 I finally got my seeds planted in mid-July, and now I have plants ready to go out for the fall season. Of course, now I have to wait for the temperature to cool down. C’est la vie. I haven’t planted any of the lettuce seeds yet, because it was already too hot here in VA by the time we received the seed packets. I’ll be planting these in about a month or so. The Basil and Marigolds are doing well, I am happy to report. My pictures came out completely craptastically, so you’ll have to pretend until I can take more tonight. 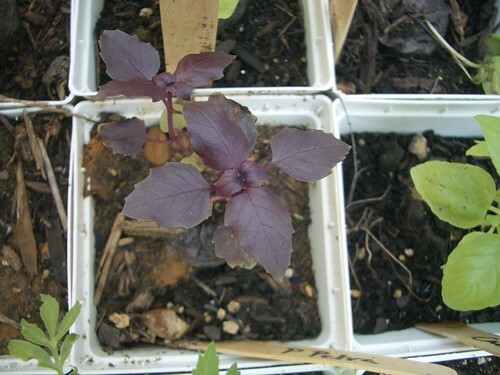 When I planted the Basil ‘Cameo’, I decided I would also plant the lime basil I acquired earlier this year, and some Basil’Purple Petra’ from Botanical Interests. Mind you, we already have ‘Genovese’ and some thai basil; but you can never have too many varieties. We use it all summer long, and hopefully I can get some saved for the winter. So far, ‘Cameo’ is doing the best of the three varieties I planted in this batch. 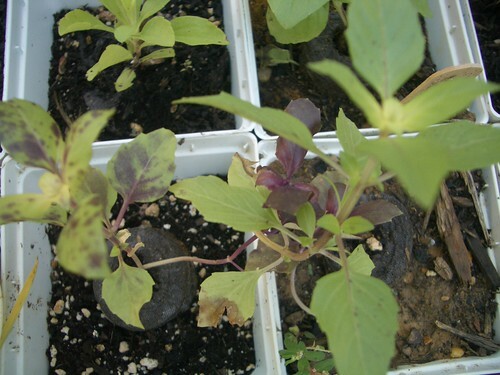 The ‘Cameo’ seeds sprouted first and had true leaves first. 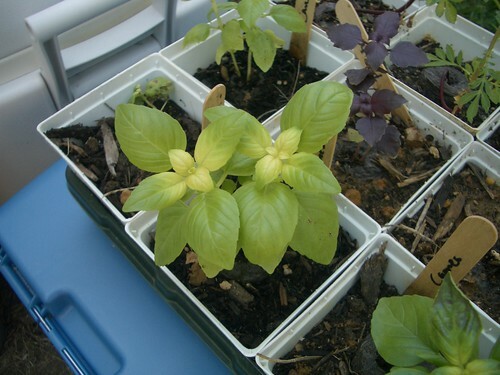 They are starting to produce a third set of leaves, while the other basil sprouts’ true leaves are barely bigger than the cotyledons. I’m growing with the SeedGROW project. Thanks to Reenes Garden for the seeds.